I originally wrote this for possible inclusion in a magazine. It didn't end up getting accepted, so I'm sharing it here instead! I never went to school. Or, to be accurate, I went to half a year of kindergarten before leaving to learn from life instead. 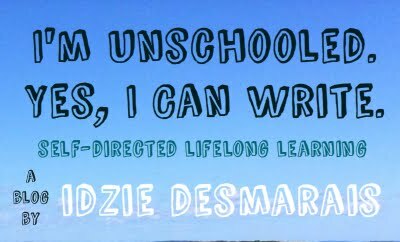 My family practiced unschooling--sometimes called life learning--which basically means learning from parents and friends, group activities and classes, books and the internet and nature and everything else that comprises the day to day happenings of our lives. It’s learning that’s guided by the interests, goals, and needs of the individual and their family. Supported by parents and mentors, a life learning education isn’t confined by an externally imposed curriculum, by grades and test results and lists of what should be learned at what time. It’s the opposite of standardized education. Instead, I’d say it’s untamed learning. And this way of learning has had a very large impact on my life. When I look at the choices I’m making now, and at the type of life I want to lead, when I think about the activities I’m drawn to, what fills me with joy and a sense of purpose, and even my political views and world outlook, I find myself asking the question, how did I get here? Why do I think and believe what I do? What led me to this place? When I trace it all back, I always seem to find the roots in growing up as a life learner. The ability for a child to freely follow passions is one of the core tenets of unschooling, if unschooling can be said to have core tenets. For years I was interested in anything to do with pioneer-settlers. I loved the Laura Ingalls Wilder books, and I adored visiting a local living history museum. There was a textile mill, a smithy, a doctor’s office, a schoolhouse, a farm... I remember watching people bake bread, make candles, and milk cows. I loved getting to chase piglets at the farm and card wool at the mill. I even had a “pioneer” themed party for my eighth birthday, where we made candles by dipping wicks repeatedly into a pot of hot wax, and lanterns to place them in by hammering holes into old aluminum cans. As I got older and learned more about the history of colonialism in North America, and the genocide and destruction settlers wrought across this continent, the way I viewed those pioneers certainly changed. But what had drawn me to that museum had never been the supposed pioneering adventure, it had always been the connection to the everyday necessities of life: building your own shelter and spinning your own yarn; growing and cooking your own food; caring for animals that provide you with fiber, and food, and even wax for candles. A life that felt connected to place, daily tasks that felt involved and immediate, not distanced and mediated by corporations and retail stores, until you never see where the products that support your life come from, and you never meet the people who grew or created them. I recently laughingly told someone that my dream life--that of living somewhere both rural and wild, building community with friends and family, keeping goats and chickens, planting big gardens, and best of all, spending lots of time making delicious food in the kitchen--was largely the same as the dreams of my six, eight, and ten year old self. Time might have changed, but what excites me now in my early twenties isn’t all that different at all. As a child, the choice to leave school was made solely by my parents. I was pretty indifferent to my brief kindergarten experience, and felt perfectly fine leaving after just a few months. I had a good childhood, filled with memories of taking turns reading poetry together as a family; learning about edible plants on homeschool group nature walks; catching frogs and grasshoppers; spending hours reading historical and fantasy novels; painting and playing and creating… I took the strangeness of the life I was leading--one without school buses and homework--largely for granted until I hit my teenage years and started to have doubts. It took a lot of personal research into radical education, along with some serious introspection, before I came to embrace life learning again. In my teens I started questioning not just the necessity of schooling, but the necessity of many institutions and cultural practices that most people take for granted. Everyone thinks you have to go to school to “get an education,” which obviously isn’t true. So what else is everyone wrong about? Because of the way I grew up, I experienced learning, both hands on and more intellectual, as something joyful and exciting. Because I chose how and what and with whom I learned, I considered all different pursuits important, and for the most part I learned to value all different types of skills and knowledge (despite cultural messages to the contrary and the insecurity I sometimes still feel). Being trusted in my learning from a young age, I learned to trust my own thoughts and feelings, and perhaps that’s why I trace so many parts of my current identity back to the way I was raised. I see the influence of unschooling tangled into my thoughts on horizontal organizing instead of strict social hierarchies (hierarchies that begin in and are entrenched by the structure of both the traditional nuclear family and schooling institutions). I see it in my belief in the human potential for growth and change and living respectfully with each other. And I know that life can be more joyful than many people seem to think, because I’ve experienced what it’s like to live life on your own terms. One of the definitions of “wildness” is that of being “uncontrolled and unrestrained,” and it seems when many people first hear about life learning, they automatically think that children must be running wild in the most negative definition of that term, without structure or what is believed to be much needed control. In reality, life learning functions more like so many systems in nature function: there are routines, repeating cycles, stages of life, and surrounding environments that all shape an individual's day-to-day living and learning. It’s a lifestyle that sometimes feels calm and comforting, sometimes wildly exciting and exhilarating, and mainly something that just feels like living a rich life. It is learning that’s uncontrolled by teachers or institutions, and unrestrained by externally mandated curriculum. It’s also learning that’s supported by parents or caregivers or mentors, who help an individual develop self-control and self-restraint of their own. 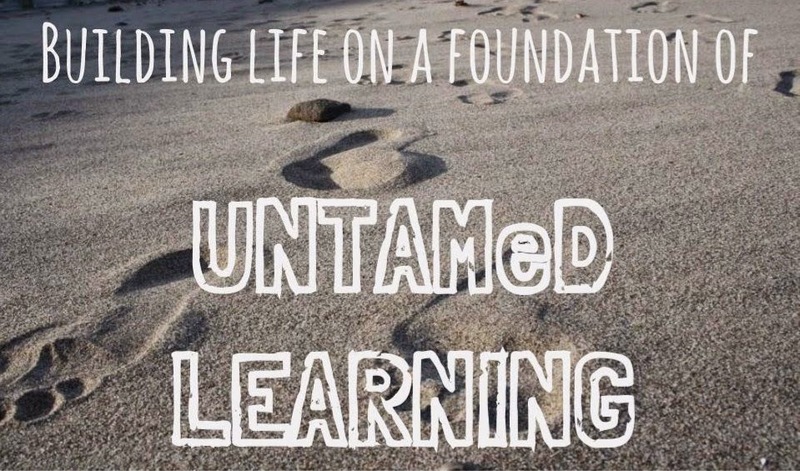 Untamed learning in the most positive definition of wildness. It’s a good foundation, really, though building up from it can still feel incredibly daunting, frustrating, and difficult. I find myself still living in the suburbs with my parents, and struggling with how to create a financial reality that can support the type of lifestyle I most want to create for myself. I have to remind myself that every step brings me closer to where I want to be, and to focus on the parts of my life that feel good and right for me. It’s in the moments of flow when reading about the fascinating subject of fermentation, or the joy of kneading bread, or burying my fingers in cool soil that I feel the sparks of rightness. This is how life is supposed to feel, I think. It feels like the hours of make believe I spent as a child, like the unadulterated excitement of learning about something new. It’s that connection to the practices that shape my life, it’s about how authentically satisfying real work feels, and it’s about always pursuing the subjects and skills about which I’m most passionate. Life and learning that’s truly untamed, shaped by our communities, shaped by the natural seasons, by the stages we all grow through in life, and by the unique experiences and interests we all have and hold dear. I’m always going to be a life learner, and it’s in this lifestyle and practice that I feel I can best create the type of life I most want to be living.